One of South Carolina’s most historic churches held a homecoming service earlier this month to celebrate an extensive renovation project that enabled it to formally reopen its doors after nearly a decade. The Church of the Holy Cross, located in the Sumter County community of Stateburg, traces its history back to 1852, when it was built by slaves. The Gothic Revival cruciform-design church features walls of yellow pise de terre – or rammed earth – and a high-pitched roof of red tile, and contains a rare organ and original carved walnut pews, according to a description of the Episcopalian house of worship on the National Register of Historic Places. Using an ancient building technique, slaves “pummeled Georgia red clay into wooden forms to create monolithic walls, 18-inches thick,” according to The State newspaper. By packing earth between wooden molds, tamping it down, and leaving it to dry, the earth became as hard as baked brick. But it was the strips of wood that were lodged between the earthen exterior and the plaster interior that gave destructive termites a path to the wainscoting, pews and ceiling of the beautiful church, the paper added. 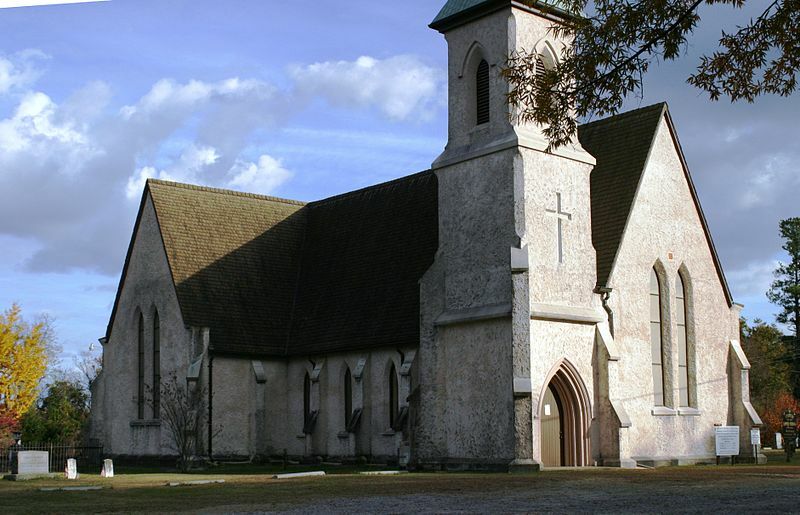 Members of the small country church off S.C. 261, which has a regular attendance of about 70, needed $2.4 million to fix the damage that started inside the walls and crept into the wood structure that holds up the soaring roof. The restoration itself took 18 months, with engineers working “with ‘a very light touch’ to simultaneously repair and protect the church,” according to Dan Elswick, senior historic-architecture consultant with the S.C. Department of Archives and History. Legal battles and fundraising kept the Church of the Holy Cross closed the rest of the time. Additional significance is attached to the Church of the Holy Cross because, along with various other structures in Stateburg, they make up the largest collection of pise de terre buildings in the US. Among individuals buried in the Church of the Holy Cross’s picturesque graveyard is Joel Poinsett, US congressman, minister to Mexico, Secretary of War and first president of the National Institute for the Promotion of Science (the forerunner of the Smithsonian Institute). Poinsett, an opponent of US Sen. John C. Calhoun’s “nullification policy,” is probably best remembered for bringing the poinsettia flower to the US from Mexico. Also buried there is George L. Mabry Jr., who was awarded the Medal of Honor for his actions in November 1944 during the Battle of Hurtgen Forest in World War II, and Theodore Dubose Ravenel Jr., who was killed on Nov. 10, 1918, less than 24 hours before the end of World War I. The Church of the Holy Cross was designed by Edward C. Jones, one of the best-known South Carolina architects of the antebellum era. Based in Charleston, his office was the training ground for such architects as Francis Lee (who later became a partner), Louis Barbot and John Devereux. Although structures such as Richard Furman Hall at Furman University and Trinity Methodist Church in Charleston still stand, much of Jones’ work has been destroyed. Charleston architect Dan Beaman, who oversaw the restoration, considers the Church of the Holy Cross “one of the finest little churches in America,” he told The State.